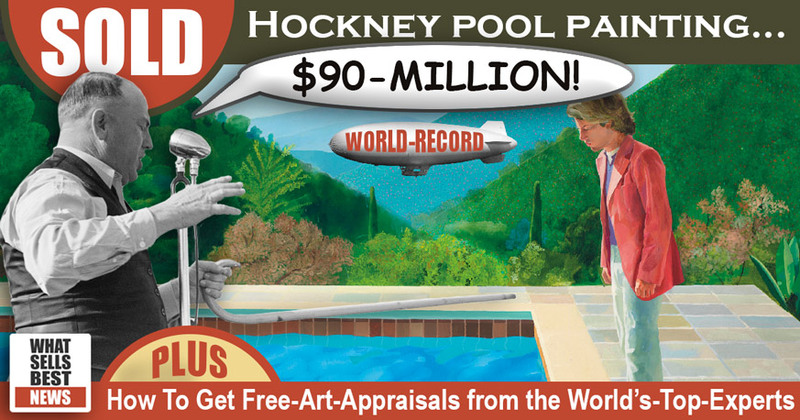 NEW YORK - Christie's reports, David Hockney’s Portrait of an Artist (Pool with Two Figures) painting, has sold for $90 million (including fees). Setting a new-world-record, for most expensive work of art by a living artist, ever sold at auction. More can be seen in this 1-minute video about the painting, shared by euro news. The full story of the sale can be found on Christie's website, here. Could You Own a Art Treasure? Find Out, with a Free Step-By-Step Guide for getting free online appraisals from the world's-top-experts, for your art. LONDON - Bloomberg reports, a 1937 portrait of a muse by Pablo Picasso entitled; ““Femme au beret et a la robe quadrillee (Marie-Therese Walter),” has sold for $69 million. The painting, measuring 21 5/8 by 18 1/8 inches, was sold by Sotheby's, as Lot 7, at their Impressionist & Modern Art Evening Sale. NEW YORK (VIDEO) - Wochit Entertainment reports, Sotheby's has sold a painting by Jean-Michel Basquiat (1960 – 1988) for a record $110.5 million at auction. LONDON - Sotheby's reports, a painting by Gustav Klimt (1862 - 1918) entitled; “Bauerngarten (Blumengarten)" has sold at auction for $58 million (£47 million). NEW YORK - News Beat Social reports Oprah Winfrey has sold painting by Gustav Klimt (1862 - 1918) entitled; “Portrait of Adele Bloch-Bauer II," sold for $150 million in a private sale. NEW YORK - Sotheby's reports a rare painting by Sir Peter Paul Rubens (1577 - 1640), entitled; "Study of a Horse with a Rider" has sold for $5 million. NEW YORK - Christie's reports, a painting by Claude Monet (1840-1926) entitled 'Grainstack' (video) has fetched $81 million at auction. NEW YORK - Wochit News reports (video) a 1902 painting by Norwegian artist Edvard Munch has fetched $54 million at Sotheby's. LONDON - Antiques and the Arts is reporting a vintage 1955 painting by Jean Dubuffet (1901-1985) has fetched $6.1 million at Christie's. NAPLES, ITALY - Euro News reports, police have recovered two Vincent van Gogh paintings worth $100 million (€89 million). LONDON -The New York Times reports a portrait of Queen Elizabeth I (1533 - 1603) has sold for $13.1 million in a private sale facilitated by Christie's (video). Painted by an unknown artist around 1590, the painting is known as the “Armada Portrait,” and recognized as one of the best known depictions of Queen Elizabeth I. Beginning October 11th, 2016, the portrait will hang on the wall in the Queen’s House. Greenwich Palace, where Elizabeth I was born. NEW YORK - U.S. News & World Report is reporting a Diego Rivera painting sold privately for $15.7 million, and set a world record price for Latin American art. The sale was handled by Phillips. How much are your paintings worth?